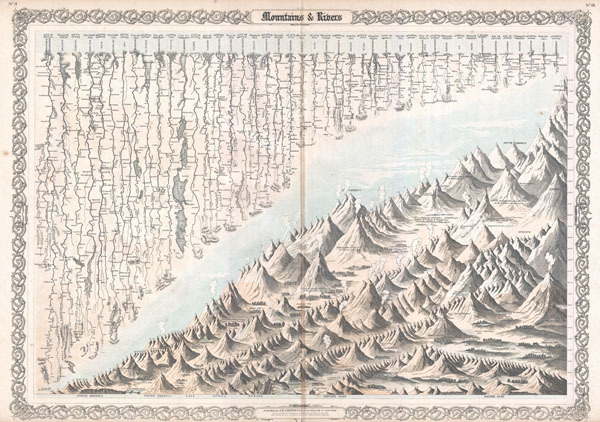 Most likely the finest American Mountains and Rivers chart or map of the mid-19th century. This is the 1855 Colton prototype for the popular 1860-1863 Johnson's Mountains and Rivers chart. Depicts the relative distances of the world's great rivers and the relative heights of the world's great mountains. Includes a multitude of details regarding the heights of important cities, glaciers, volcanoes, and tree lines. Even includes Niagara Falls, the Great Pyramid, St. Peter's Basilica in Rome and St. Paul's in London. Also notes curiosities that would have been relevant at the time, such as 'The Greatest Altitude of the Growth of Peruvian Bark,' 'The Glacier of Maladetts,' the 'Table Land of Pamar,' and the 'Greatest Altitude attained by Humboldt 19400 ft.' Replete with additional geographical errors and misconceptions common to the period. Surrounded by the traditional Colton vine motif border which was dropped from certain later issues of the atlas. It is extremely rare to find this map such good condition because it was issued at the front of the Colton Atlas, where most of the heavy damage from moisture, soiling, and general use was sustained. Colton, G. W., Colton's Atlas Of The World, Illustrating Physical And Political Geography. By George W. Colton., (1855 or 1856 issue). Very good condition. Minor centerfold discoloration. Blank on verso. Lower margin trimmed to printing. Rumsey 0149.001. Phillips, Philip Lee, A List of Maps of America in the Library of Congress, pg. 1100.